When the "Pilion" was moored at the Macapa anchorage, two robbers armed with knives boarded the vessel using a rope with a hook in position 00.03.50 N, 050.57.80 W, on March 10, 2019, at 04.30 a.m. The Duty Able Seaman on routine rounds spotted the robbers and immediately informed the Officer of the Watch, who raised the alarm. Ab announcement on the PA was made, and the crew was mustered. Seeing the alerted crew, the robbers fled the vessel and escaped without stealing anything. The incident was reported to the Macapa Port Authorities. 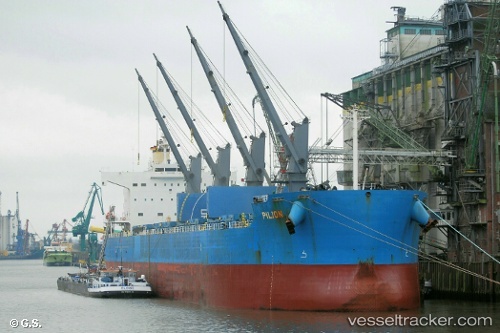 The bulkcarrier sailed from Macapa on March 11 headed to Itacoatiara. On Jan 31, 2018, at 10.30 a.m. the "Pilion" was subject of an inspection in Hamburg-Wilhelmsburg at the Southern Reiherstieg, during which officials of the Water Police (WSPK 32) found a violation of the Ballast Water Convention. The Department of Environment and Energy (BUE) ordered a security deposit. The ship had not exchanged the ballast water, although this was required by the Ballast Water Convention. It had reached the port of Hamburg in the morning of Jan 23 empty and with ballast water from Huelva in order to be loaded. At the time of the inspection, about 15,000 tonnes of ballast water had already been discharged at the berth in an illegal manner. A security deposit of EUR 33,551 had to be paid by the Russian First Officer (52) for unauthorized introduction of ballast water according to the Water Resources Act (WHG). In addition, a further security deposit of EUR 1,000 was ordered against him and the Greek captain (63) by the Federal Maritime and Hydrographic Agency (BSH), because in the so-called garbage diary no waste water disposal was registered for two years and the waste management plan was inadequate. The ship left Hamburg again on Feb 1 at 5.45 p.m., bound to Mombasa.